Republican Jeb Bush, once targeted by Democrats following the botched 2000 election, easily defeated Democrat Bill McBride and attempts to humble his brother, President Bush, as he won a second term as Florida's governor. With 99 percent of precincts reporting, Bush had 2,783,346 votes, or 56 percent, while McBride had 2,132,185 votes, or 43 percent. 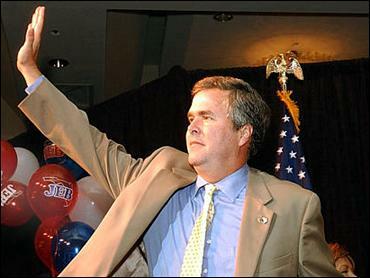 The victory made Bush the only Republican governor ever to capture re-election in Florida and improved upon his 1998 drubbing of Buddy MacKay with 55 percent of the vote. "I am so grateful for your support and I thank you from the bottom of my heart," Bush said in his victory speech. "I will not let you down. I will work as hard as I can." Bush watched returns from his hotel suite in downtown Miami where he was joined by his family, including his parents, former President Bush and former first lady Barbara Bush. In his victory speech, Bush called his parents "my inspiration in life." National party officials considered this marquee race pivotal. Bush's victory bolsters the re-election bid of President Bush, while a loss would have been embarrassing to the president. The race was under extraordinary scrutiny for another reason: State and county officials spent millions on new touchscreen voting machines after the 2000 presidential election marred by chads, recounts and court fights. Justice Department observers were posted at some polls, as were specialists in watching Third World elections. Several figures from the 2000 debacle were running for House seats Tuesday, including GOP darling Katherine Harris, the former secretary of state at the center of the recount debate. Harris defeated political novice Jan Schneider in the heavily Republican 13th District. But the governor's race was the key matchup. Bush, 49, held a massive fund-raising advantage, and he stressed his work to bring accountability to public schools, reduce taxes and foster a pro-business climate. McBride, 57, a Tampa lawyer and first-time candidate, upset former Attorney General Janet Reno in the primary and challenged Bush on education. He called for increasing teacher pay, smaller classes and reducing the state's emphasis on grading schools and use of standardized tests. McBride had to scramble to address black and elderly voters after concentrating elsewhere before the primary. And criticism of Bush over the state's troubled child welfare agency never seemed to stick. McBride, in his concession speech in Tampa, said his campaign had placed a spotlight on the importance of public education. "We've moved the agenda into, I think, the right place in large measure because of your efforts," McBride said. "That's good for Florida, that's good for the public schools, that's good for the teachers and the working men and women of Florida." Bush won north Florida handily and won five key central Florida counties - Orange, Osceola, Pinellas, Pasco and Volusia - carried by Democratic Vice President Al Gore in the 2000 presidential election. Bush also won McBride's home county of Hillsborough and was leading in his home of Miami-Dade County, also carried by Gore in 2000. "I think right now you'd have to say Democrats would be at the lowest point they've been in the history of Florida," said former Attorney General Bob Butterworth, who was derailed in his state senate race. "I think we're still a two-party state, but Democrats stayed home today." Bush's second term could begin with immediate challenges. Already facing a tight budget, Bush will have to find money to implement a constitutional amendment limiting class sizes that was narrowly approved by voters. The governor vehemently opposed the measure, saying it would force tax cuts or a drastic reduction in services. Bush is only the third Republican elected Florida governor since the 1870s - Claude Kirk in 1966 and Bob Martinez in 1986 were the others and both lost re-election bids. Florida governors were prohibited from serving two terms before 1968. McBride received help in the campaign's final days from party luminaries such as former President Clinton, Gore and the Rev. Jesse Jackson, who worked to increase turnout among black voters. None of those efforts swayed Richard Jones, a 68-year-old retiree from Sanford. "I don't know how anyone could vote for McBride when Jeb is doing such a great job," Jones said. "No one influenced my vote - not the president, not commercials, not Jesse Jackson."